"It is appropriate that the alphabetical arrangement here adopted should give pride of place to an account of the Adams Potteries, for the story of the Adams family of North Staffordshire takes us back as far as 1299 and suggests that they are the oldest potter family of which record exists. We must confine ourselves to the briefest details of the family history prior to the eighteenth century, by which time, as Master Potters, they ranked with the best – the Astburys, Wedgwoods, Woods, Mayers; with Whieldon, Turner and Spode. The present principals of the firm trace their descent in a continuous and unbroken line from William de Adams of Burslem, born 1365, who died in 1417. The earliest record of an Adams producing Pottery lies in the report of 1448 of William and Richard Adams (grandsons of the above) being fined for digging clay (obviously for the making of ceramic wares) by the roadside in Burslem. These two members of the family were both described in the Tunstall Court Rolls as Master-Potters and are the first to be described as such. Since William and Richard there have been seventeen generations of the Adams family, every one of which, with the exception of three generations in the sixteenth century, is known to have carried on the ancient and honourable craft. No family can show a comparable record to this. An important landmark in the seventeenth century was when, in 1657, Robert Adams and his son John of Hadderridge and Brick House, established the Brickhouse Potteries. At the time these were the only works of any size yet built in Burslem. The son and two grandsons of this John (the latter named John and Ralph) carried the business on the road to success, particularly Ralph who, as Master Potter, enlarged the Brickhouse Works and did much otherwise to improve the output. Still another John followed his father Ralph, during whose time the Brickhouse Pottery became famous for its salt-glaze wares, the secret of which it has been said. had been discovered by William Adams (1642-1712) and a Bagnall potter named Palmer. We must remember, however, the much earlier discovery by Dwight of Fulham, which in 1571 was patented as his 'mystery of transparent earthenware'. The Elers probably brought it to Staffordshire and Burslem became the chief centre of its manufacture. At this time the Brickhouse Potteries were making wares as fine as any Elers produced including salt-glaze, dinner, tea and coffee services, mugs, cups, bowls, etc.– a full range of useful wares of good quality. Coming well into the eighteenth century we must next notice Richard Adams (1739-1811) of Cobridge and Bankhouse, Bagnall. His father was a William and his mother a member of the Whieldon family. The Cobridge works made a wide range of salt-glaze ware such as was being made by Astbury and Whieldon. He never made cream ware. About 1790 he retired, at which time his cousin, William Adams of Greengates was in the forefront as a maker of blue printed wares, Jasper and stone ware, while another cousin, also a William, was paramount at Cobridge. Other members of the family were in the industry as contemporaries. There was Joseph Adams of Burslem, who must be mentioned if only because one of his Daughters married one of the Bagnall branch and had a son (William) who, at Greengates, made the original Adams' Jasper wares, which rivalled that of Wedgwood. He was born in 1746 and died in 1805. Throughout his career he was a friendly rival of Wedgwood; but his Jasper was not copied from the latter. It was an independent discovery, as was that of Turner of Stoke-on-Trent. William Adams and Co. of Burslem specialised in cream coloured ware and China Glazed Ware. He had works at Tunstall from 1799 and, later, at Newfield not far from Greengates. As potteries went in those days Greengates was extensive and famous. But, though large, it was found inadequate to his growing needs – hence the Newfield works. He had a depot in Fleet Street, London, where tea sets, plaques, scent bottles, cameos, buttons and lamp-pedestals were bought by the fashionable world. It is interesting to note that this William Adams was commissioned to supply the famous architects Robert and James Adam with dainty plaques of Jasper ware for insertion in mantelpieces, cabinets, etc. thus contributing not a little to the charm and distinctiveness of the famed 'Adam style'. The factory at Newfield was given up in 1805, leaving Greengates to be carried on by Trustees, since Adams died in that year. His son Benjamin stepped into his shoes, devoting his attention to stone ware and blue printed and painted wares, such as his father had made. He had not the artistic gifts of his father, however, and, having indifferent health, production fell off and he sold Greengates in 1826. It thus passed out of the family, but it is gratifying to know that it has since come back into the Adams possession. John Adams, of whom we have spoken, had a son William, born in 1748 and only nine when his father died. This was the occasion when Brickhouse Pottery was leased to Wedgwood. When, in 1769, young Adams came of age he assumed control and carried on until about 1774-75 when the factory was again let, this time to William Bourne, but he retained Cobridge. About this time Adams was experimenting with transfer-printing, as were Baddeley, Spode and William Adams in Tunstall. The printed wares made at Cobridge were of good design, and well engraved. He owned his own mills for grinding glaze at Milton, he had water-mills at Stanley, tileworks at Trent Vale as well as collieries and a colour mill at Bagnall and Dale Hill and paper mills at Sheddleton. Richard Adams of Cobridge and Bagnall died in 1811. His only son William was a great potter who, in 1793, joined Lewis Heath of Burslem, whose daughter he married. He left the Burslem potter in 1804 and set up at Upper Cliff Banks at Stoke, where he made blue printed ware like his cousin at Cobridge. Besides earthenware he made bone china like his friend Spode. By the early nineteenth century William Adams had expanded his business greatly. He had six factories producing – five at Stoke and one at Greenfield, besides two at Burslem let to John Wedgwood and Enoch Wood and Sons. Taking his sons into partnership the firm became William Adams and Sons with extensive overseas connections and they turned out every type of useful earthenware, hospital wares and stone ware, besides high grade dinner and tea services. In the 1840's they followed Copeland's lead in making 'Parian' ware figures modelled by Giovanni Meli and W. Beattie. In 1853 the senior partner William left to take over Greenfield, while Edward and Thomas carried on the other firm until 1863 when the Stoke pottery closed, the good will passing to Greengates, Tunstall. At the present day William Adams and Son of Tunstall worthily carry on the long tradition. 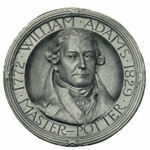 Among the great potter families they are unique for they are directly descended from the Adams of Brick House, Burslem and Cobridge, of Greengates, Bagnall, Stoke and Greenfield, in unbroken succession for at least eleven generations and are the seventeenth generation in succession from the first Adams to carry the title 'Master Potter'.